"Election is a secular exercise and therefore a process should be followed....the relationship between man and god is an individual choice and state should keep this in mind",said the majority. Delivering a landmark ruling, the Supreme Court today held that seeking votes in the name of religion, caste or community amounted to corrupt practice and election of a candidate who indulged in it can be set aside. A seven judge constitution bench of the court headed by Chief Justice T S Thakur who retires tomorrow passed the ruling by a 4:3 majority. The bench was interpreting section 123(3) of the Representation of Peoples Act. Justices D Y Chandrachud, A K Goel and U U Lalit dissented from the majority view. "Election is a secular exercise and therefore a process should be followed....the relationship between man and god is an individual choice and state should keep this in mind", held the majority view. On their part the dissenting judges said such an interference by the court almost amounted to judicial redrafting of law. They said prohibiting candidates from articulating issues effecting voters reduced democracy to an abstraction. They added that such decision should be best left to legislature. "No government is perfect. Law does not prohibit dialogue or a discussion of a matter which concerns voters" they said. The bench was dealing with the appeal filed in 1992 by BJP leader Abhiram Singh, whose election to 1990 Maharashtra Assembly was set aside in 1991 by the Bombay High Court on the ground that he had appealed for votes on the basis of Hindu religion. A three-judge bench on April 16, 1992 had referred Singh’s appeal in which the same question and interpretation of sub-section (3) of Section 123 of the Act was raised to a five-judge Constitution Bench. While the five-judge bench was hearing this matter on January 30, it was informed that the identical issue was raised in the election petition filed by one Narayan Singh against BJP leader Sunderlal Patwa and the apex court’s another Constitution Bench of five Judges has referred a larger Bench of seven Judges. Thereafter, the bench headed by Justice Lodha referred Singh’s matter to the Chief Justice for placing it before a seven-judge bench. On October 25 the seven judge constitution bench of the Supreme Court which was hearing a slew of petitions relating to decisions and questions on electoral malpractices arising out of its earlier judgments said for now it will not touch on its 1995 definition of “hindutva is a way of life and not a religion” and also not ban its use during elections. The bench said for the time being it is just focusing on a question- “Will a religious leader’s appeal to his followers to vote for a particular political party amount to electoral malpractice under Section 123 of the Representation of People Act” The 7-judge SC bench said it was only examining a nexus between religious leaders and candidates and its legality under Section 123 (3) of the Representation of People Act. The clarification came while the bench rejected a plea filed by activist Teesta Setalvad who asked the bench to redefine Hindutva and also sought a ban on the use of the term in elections. However, the apex court said it won’t reconsider the 1995 judgment. “We will not go into the larger debate as to what is Hindutva or what is its meaning. We will not re-consider the 1995 judgement and also not examine Hindutva or religion at this stage.At this stage, we will confine ourselves to the issue raised before us in the reference. In the reference, there is no mention of the word ‘Hindutva’. If anybody will show that there is a reference to the word ‘Hindutva’, we will hear him. 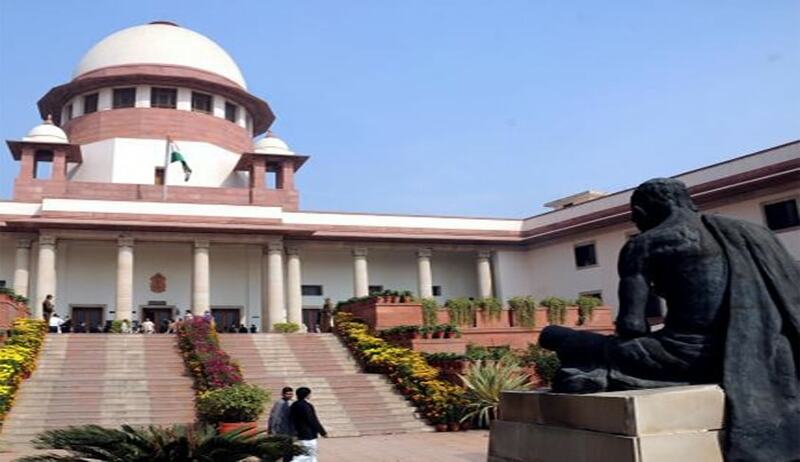 We will not go into Hindutva at this stage,” said the bench of Chief Justice T S Thakur and Justices M B Lokur, S A Bobde, A K Goel, U U Lalit, D Y Chandrachud and L Nageshwar Rao The remarks were made by the bench when, at the outset of the hearing, some advocates sought to intervene in the ongoing hearing which commenced last Tuesday. Last week, Setalvad had sought to intervene in the matter with an application stating that religion and politics should not be mixed and a direction be passed to de-link religion from politics. The matter had ended up with the seven judge bench as questions were raised on its 1995 verdict by a three judge bench which held that vote in name of “Hindutva/ Hinduism” did not prejudicially affect any candidate and since then three election petitions are pending on the subject before the apex court. On February 2, 2014 a five-judge Constitution Bench comprising Justices R.M. Lodha, A.K. Patnaik, S.J. Mukhopadhaya, Dipak Misra and Ibrahim Kalilfulla, posted the issue for consideration by the seven-judge Bench, along with a reference of seven-judges of an appeal already made as early as in August 2002, pending adjudication. The apex court’s three-judge bench in 1995 had held that Hindutva/Hinduism is a way of life of the people in the sub-continent and “is a state of mind.” The judgment was delivered in the case of Manohar Joshi versus NB Patil which was authored by Justice JS Verma who found that statement by Joshi that “First Hindu State will be established in Maharashtra did not amount to appeal on ground of religion.” The observation was made while dealing with the question regarding the scope of corrupt practices mentioned in sub-section (3) of Section 123 of the 1951 Representation of People Act. In elections in Maharashtra after the 1992-93 Mumbai riots, Shiv Sena leader Manohar Joshi had promised to turn Maharashtra into India’s first Hindu State. The Bombay High Court nullified Joshi’s election as by seeking vote in the name of religion he violated the constitutional commitment to secularism. However, the former Chief Justice of India, J.S. Verma, heading a three-judge Bench of the apex court, overturned the High Court verdict. Subsequently, the five-judge Bench also held that a candidate would not be guilty of a corrupt practice if he/she appealed to persons to vote or not to vote on grounds of religion as long as it was not his/her religion. The issue was thus referred to a seven-judge Bench. Referring the matter to a seven judge bench, Justice Lodha had observed: “It is a matter relating to elections. Whether one can seek vote in the name of religion has to be considered by the larger Bench.” “Be that as it may, since one of the questions involved in the present appeal is already referred to a larger Bench Of seven Judges, we think it appropriate to refer this appeal to a limited extent regarding interpretation of sub-section (3) of Section 123 of the 1951 Act to a larger Bench of seven Judges. “The Registry will place the matter before the Chief Justice for constitution of a Bench of seven Judges. The matter may be listed subject to the order of the Chief Justice,” the January 30 order said. It said,”In the course of arguments, our attention has been invited to the order of this Court dated August 20, 2002 in Narayan Singh vs. Sunderlal Patwa 1. By this order, a Constitution Bench of five Judges has referred the question regarding the scope of corrupt practice mentioned in sub-section (3) of Section 123 of the 1951 Act to a larger Bench of seven Judges.”This became necessary in view of the earlier decision of a Constitution Bench of this Court in Kultar Singh vs. Mukhtiar Singh,” the bench said.